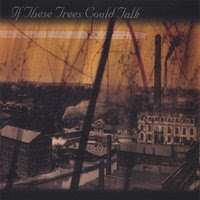 Akron, Ohio's If These Trees Could Talk are probably the biggest musical surprise I've come across this year. Their self-titled, self-released EP provides an almost trance-inducing collection of metallic-tinged instrumentals that might induce an out-of-body experience if listened to under the right conditions. The band is powered by three guitarists who provide some incredibly nuanced playing. For a completely instrumental release, the CD is pleasantly devoid of needless guitar wanking. Each song is comprised of obviously technical playing but it's done in a way that benefits the song at hand rather than existing to self-promote the ability of any one musician. The production on If These Trees Could Talk is amazing for a self-recorded, self-released disc. If a major label were to release a disc of this quality, production-wise, no one would guess it was done by the band themselves. The only real problem with the album, as a whole, is that the songs tend to blend directly into one another a bit too much and, after a few listens, begin to sound a bit too similar. If the songs and performances weren't as strong as they are, that would really hamper the enjoyment. Thankfully, taken individually, each song is mammothly powerful and expressive even without vocals or lyrics. For a young band on its first release, that's an enormous achievement. You say that it is "self-released", but you list the label "Procedure Records" in the beginning. I find this confusing. Good to see some love for this great band anyways. As you can see, the comments on the albums are not written by us! Probably you are right in this, but the music is here anyway, so enjoy! It was self-released and then it was picked up by a label.